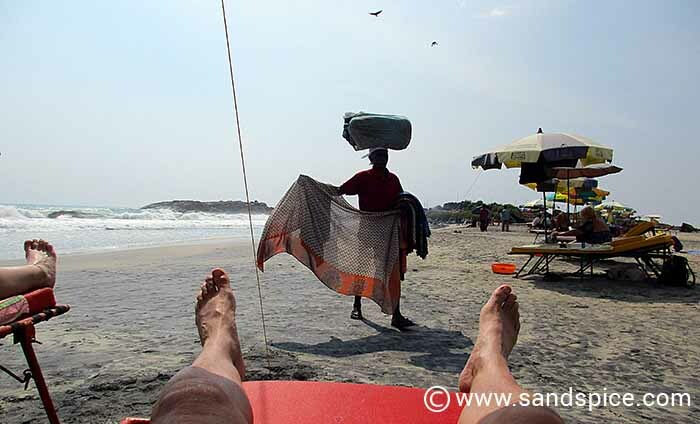 One week before arriving at Kovalam Lighthouse Beach, I sent an email to our hotel requesting an airport pickup. The fact that I got no reply should have been an early warning sign. When we arrived at Trivandrum airport, I reckoned there was a 50/50 chance that someone would be waiting to pick us up. No problem. Instead we took a prepaid taxi from the Trivandrum Domestic Airport Taxi Service, This cost 500 rupees (€7) – half the price that the hotel would have charged us. We found our run-down looking hotel not far from the taxi drop-off at Kovalam lighthouse beach. The Vedante Wake-up is part of a chain of guesthouses in India. We were not too surprised to see there was some confusion about our booking: Clearly they were not expecting us. However, this wasn’t going to be a problem since there happened to be rooms available. The room we were given was large enough, with a good-sized bathroom and a wide terrace. The room itself was pretty grubby: It looked like it hadn’t been cleaned from the previous guests. The beds had stained sheets with human hairs and the quilts looked suspect. The large bath was heavily engrained with brown stains, so that was not going to be an option – fortunately there was a separate shower. We had soap but no toilet paper and only one towel. The plaster was crumbling off the walls in the bedroom, and the doorlock was flimsy. On the positive side, the shower was strong with plenty of hot water, and we had an air-conditioned room (which we hadn’t booked). There were also no visible bugs or insects, apart from what I feared might be lurking in the bedding. Well, we’ve stayed in worse places, so we decided to embrace the true Indian experience (but would sleep in our clothes). It was only going to be for 3 nights, and we hadn’t paid too much for it online – just €18 per night. The pity about this guesthouse is that with just a little extra care, maintenance and regular cleaning it could be quite nice. The young guys running it spent most of their time outside in the garden playing cricket with a home-made bat: Servicing the hotel seemed to be a secondary priority. There was wifi at the Hotel Vedanta Wake Up, but you have to sit in their squalid mosquito-ridden lobby to use it. 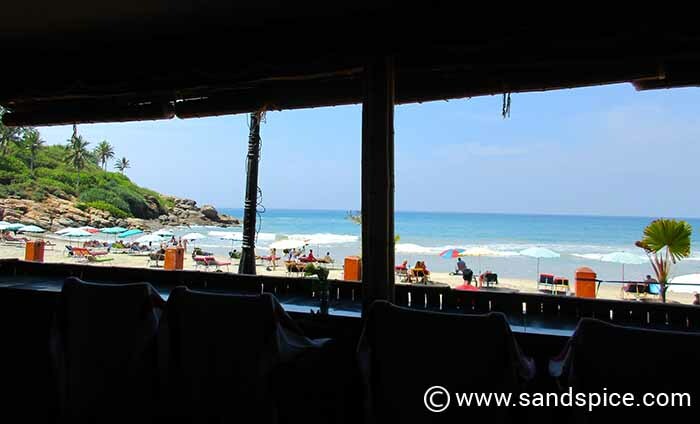 Kovalam Lighthouse Beach is a 500-meter strip of restaurants, bars and local shops. 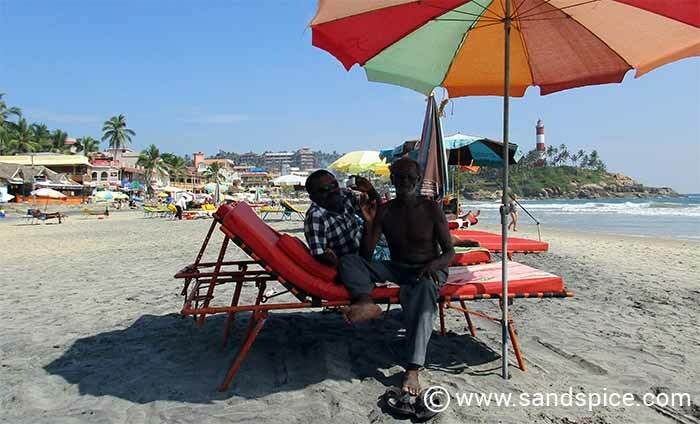 The beach itself is divided between a dozen or so hawkers who will rent you 2 beds & umbrella for anything between 100 and 400 rupees for the day (€1.50 – €6). 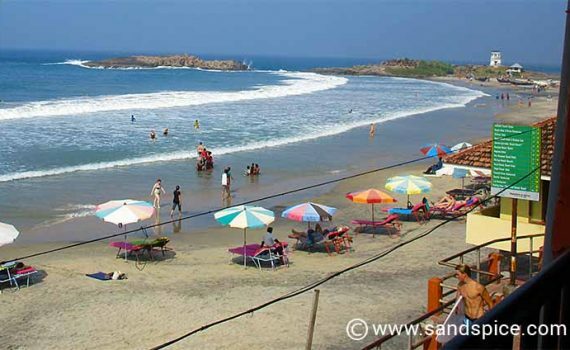 Kovalam hosts a high density of hawkers selling a wide variety of products. In fact, almost every local you encounter will try and sell you something you don’t want at 2 to 3 times higher than the going price. This means you will spend a great deal of your time politely declining their persistent efforts to sell. As a foreigner, you get this to some degree everywhere you go in India. If you’re into yoga or ayuvedic medicine, this is a great place to practise. Otherwise, apart from lying on the somewhat crowded beach, eating, and haggling with street vendors for various trinkets, there’s not a lot to do. You can bathe in the sea, but it’s difficult to swim due to the large waves and powerful undercurrents. Several people drown here each year, despite the whistles and red flags of the lifeguards. You can visit the lighthouse at the end of the beach for 25 rupees (more if you want to take a camera). Somehow, it was always closed whenever we wandered up there. 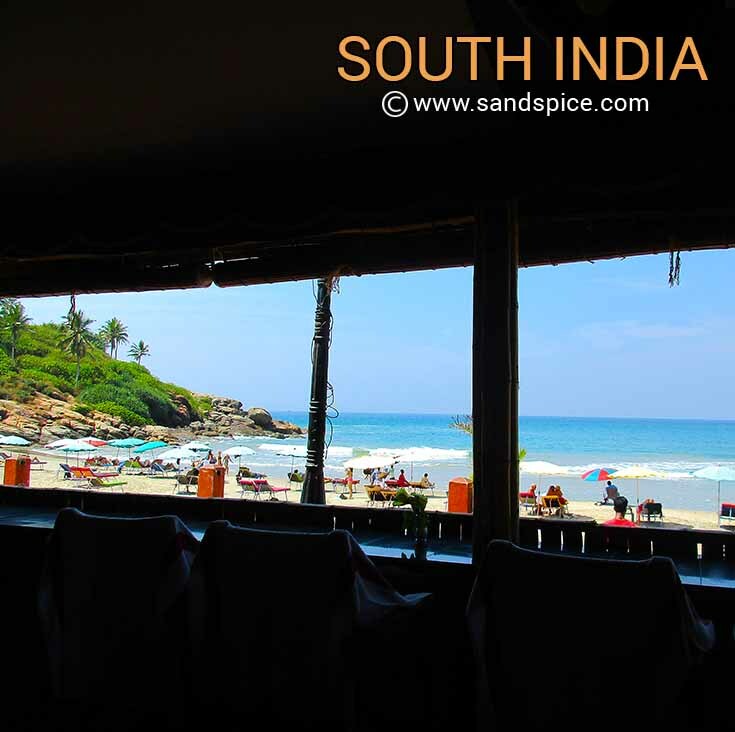 Dinner for 2 at the restaurants in Kovalam typically costs from 700 to 800 rupees (€9 – €11) – drinks included. Lunch is around half that at 400 to 500 rupees. Many places offer good value lunch thali’s. The best restaurants are not on the front strip facing the beach. You need to scout out the back streets to find better quality food and service (and without someone trying to drag you in off the street). The best meals we had were both vegetarian. At the Lonely Planet Pure Vegetarian Restaurant we ate a tasty meal including Navarathna Kurma: A highly rich & delicious kuruma with paneer and vegetables. Together with banana lassies and accompanying dishes our combined bill for 2 came to 725 rupees (€10). This restaurant has a beautiful garden setting next to a small lake. The soothing Indian background music they played here was just right- and I was able to purchase a copy of the CD from them for 100 rupees. Many of the young people studying yoga eat here. At the Suprabhatham Organic Vegetarian Restaurant we enjoyed another excellent meal in their calm and secluded garden area. Here we ate a Paneer curry, vegetable Jal Frezi, rice, chapattis and lassies. Our bill camne to 770 rupees (€11). Most (non-vegetarian) restaurants discretely sell large bottles of beer at around 100 rupees per bottle (€1.50). If you’re a wine drinker, forget it: one glass can cost 400 rupees (€6). Lassie’s cost 90 rupees. 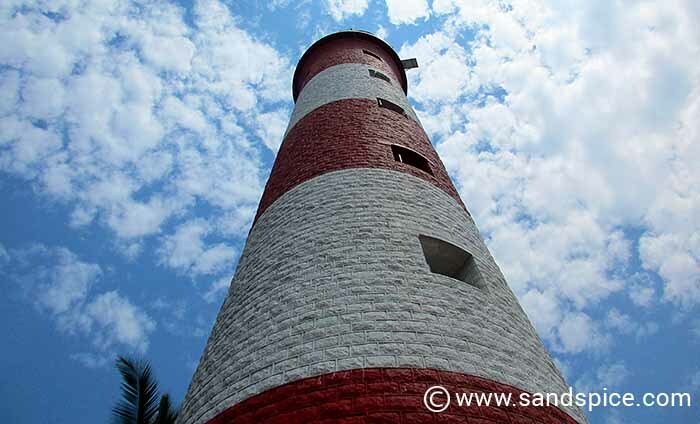 I last visited Kovalam lighthouse beach back in 1996, when it was much more of a backpackers and hippie scene. Costs have soared since then, but it is still a relatively low-cost holiday destination. 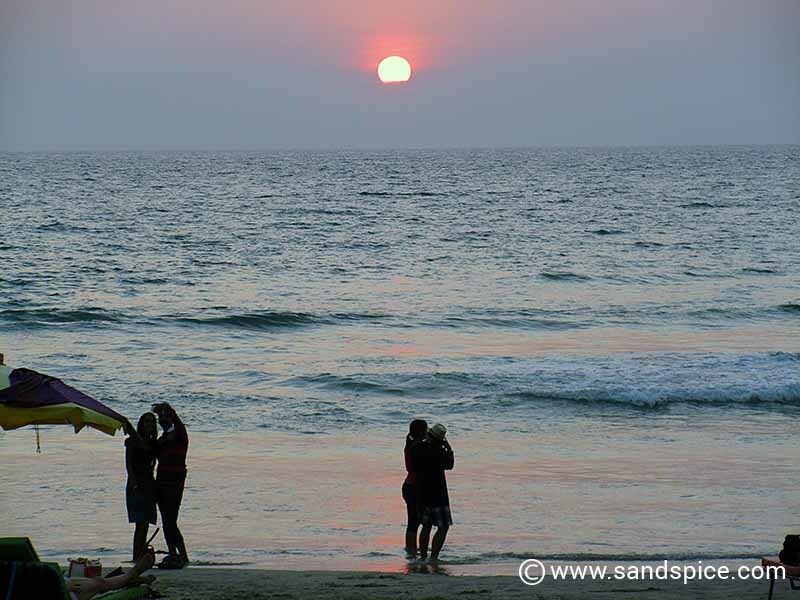 However, if you’re looking for something a little more chilled-out, check out South Goa. The day before we were due to leave Kovalam, we checked in with a beach-front Travel Agent to try to arrange our onward travel. We’d decided to take a taxi from Kovalam to Varkala, but we still needed to arrange either a bus or train to travel the 169 kms north from Varkala to Kochin. After 3 days in Kochin we had a gap in our schedule of another 3 days. During this time, we planned to work our way northwards, 733 kms up to Canacona in South Goa. We’d already tried booking trains online, without success (most were fully booked 6 weeks before departure!). The Travel Agent checked train schedules for us, but by now our options were dwindling. However, we managed to book 2 seats on the Rajdhani Express in an AC2 class coach, taking us from Varkala to Kochin. Our later trip from Kochin to Goa would be more complicated. There were no direct train seats available on the dates we wanted. Our best option was to travel from Kochin to Mangalore (AC3 class), and then Mangalore to Karwar in South Goa on the following day (Sleeper class). We paid just over 2,000 rupees (€39) for these tickets, including agents fees. For details on the different train classes see Sleeper Class to Kochin.